Adam and Eve | What's for dinner? Please someone out there tell me that you have a slow cooker recipe for something like the divine beef ribs at Cherry Creek Grill, also knows as Bandera in some cities. I was planning on only eating half but this was far too heavenly. Not too BBQ flavored, but sticky and delicious! I hope my friend Courney wasn’t offended by me gnawing at the bones. BTW – my very favorite thing about this restaurant, which has kept me coming back for 13 years, is that the service is exceptional, every time, bar none. 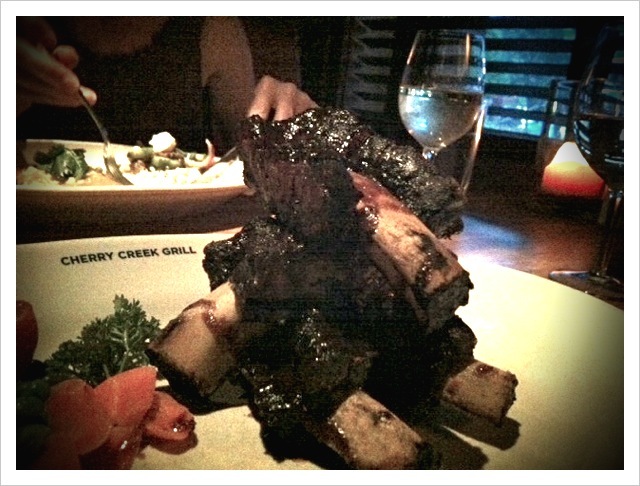 This entry was posted in Cherry Creek Grill, Recipes, Restaurants and tagged Beef Ribs, Cherry Creek Grill. Bookmark the permalink.